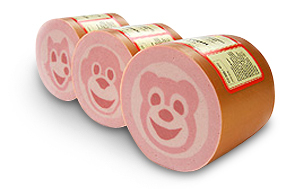 When it comes to processed meat products with design, there is one major competitive advantage that the Feldhues Group can offer: the quality of the finished product is far above the quality of products that are manufactured with the widely available so-called extrusion technology. The production equipment developed and installed within the Feldhues Group assures that the finished products are of consistent visual quality. Shape definition is of the highest standard. Up to 5 different coloured meat emulsions can be used to create outstanding products. The common extrusion technology will only offer inconsistent product quality, mostly reducing itself to 2-colour-fillings. In order to live up to the high quality standard set for our products, all manufacturing sites are obliged to produce under a strict quality control system. The basis is a complete and fully integrated HACCP-system. In addition, diverse production areas have been certified to IFS and BRC standards. Within the group, systems include external 24h-temperature-control, air-conditioned high-risk areas for slicing and packing as well as sophisticated hygiene, metal detection and laboratory technology. Computer-based IT systems cover purchasing, production and sales management. As such, it guarantees full product traceability. In addition to internal quality control measures, the plants are under the supervision of local veterinary authorities.